Vector Informatik India Prv. Ltd.
CANalyzer.CANopen provides the developer with a universal analyzing tool for CANopen devices and networks. With powerful functions and user-programmability, all needs are covered from simple network analysis to advanced troubleshooting of complex problems. CANalyzer. CANopen now includes the project design tool ProCANopen and the EDS editor CANeds. In a trace window the CAN message traffic is displayed while simultaneously interpreting the protocol information it contains. The user not only sees the service that is currently being executed, but can also see all relevant service parameters at a glance. This information is displayed in clear text and gives the user a quick overview of the chronological order of individual protocol sequences for the observed CANopen services thereby making it significantly easier to localize errors in a real system. 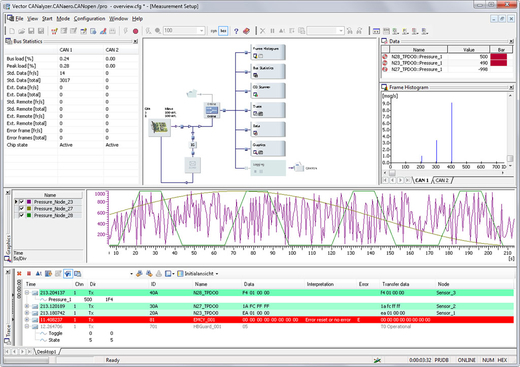 Bus analysis is simplified considerably by using separate colors for different CANopen services in the Trace Window. A font and background color may be defined for each category to recognize messages easier and faster (see image at the bottom). Message categories include: SDOs, PDOs, EMCY-, SYNC- and NMT messages. CAN messages that are part of a SDO protocol, for example, are detected and shown in the appropriate color. If there are any signal definitions (objects segments which can be defined within the new XML standard) made within the EDS file, those signals are displayed in the Trace Window automatically. The CANopen Scanner evaluates CAN messages and shows the active nodes in a list. Other node-specific information is also output, such as the node state and device name. The object directory for an individual device is shown in a tree structure that is structured as a function of user inputs. The objects to be shown are taken from the EDS file for the relevant device. It is easy to read-out and modify device parameters that are mapped into a device by object dictionary entries. This is how the user can configure necessary settings in a device. In the modification of PDO parameters the access dialog considers the access order specified by the CiA 301 communications profile. If no EDS file exists for a device, it is still possible to access the object dictionary by a special dialog. Changes to device parameters are stored separately for each device in a device configuration file (DCF). EDS files can be tested with the built-in EDS Checker. This is the same test program that is also used for the CANopen Conformance Test. Additionally, a check is also made to determine whether PDOs can be configured as they are specified by attributes in the object dictionary. For example, if the mapping of a PDO is not modifiable, but the associated EDS file states the opposite, this discrepancy is easily detected. CANalyzer.CANopen contains a functionality for the configuration, testing and start up of CANopen devices such as PLCs, control systems, drives, remote I/O, encoders, etc. For test purposes CANalyzer.CANopen offers a dialog-based creation of CANopen-specific message sequences. From a project-specific list of existing messages, the user selects and configures the desired messages (PDOs, SDOs, etc.) and assembles them into a sequence. The sequence can be replayed once or periodically. This means that message sequences can be sent to the connected devices as often as desired. CANalyzer.CANopen uses the standardized file formats EDS and DCF to store data. Also the new XML format (XDD and XDC) regarding CiA 311 is supported by the CANalyzer.CANopen. Simple data exchange with any other CANopen tool such as ProCANopen or CANoe.CANopen is guaranteed.